Notes: The Kemp Town branch line opened on 2nd August 1869 and although only just over a mile in length it was a costly line to construct as, for most of its length, it ran through a tunnel or on a viaduct or embankment. The construction could never be financially justified but rivalries between the London Brighton & South Coast Railway who built the line and the London & Chatham & Dover Railway who wanted to build their own line into Kemp Town ensured that the fashionable suburb of Brighton got its own terminus. The line took five years to build, diverging from the Brighton - Lewes line just east of Ditchling Road Tunnel. The branch curved southwards on an embankment to Lewes Road Station which consisted of an island platform and a second platform with the main buildings; the station was accessed by a covered flight of steps from Lewes Road. Beyond the station the line was carried on a fourteen arch viaduct over Lewes Road followed by a three arch viaduct over Hartington Road to the short lived Hartington Road Halt. 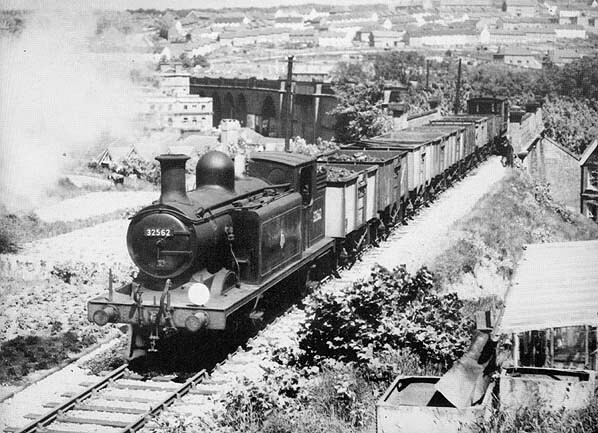 From there the line entered a short cutting before entering the 1024 yard Kemp Town Tunnel through Race Hill. Kemp Town Station itself had a single platform with room for expansion which never happened and an extensive goods yard. Despite its high cost the line never carried many passengers. Lewis Road Station was opened on 1st September 1873 and Hartington Road Halt was added on 1st January 1906. Passenger numbers failed to improve however and the new halt closed five years later. The branch closed completely during WW1 but was reopened to passengers on 19th August 1919 and to goods three years later. With strong competition from trams and busses the branches days were numbered and the inevitable came on 1st January 1933 when the line finally lost its passenger service for good. Freight traffic continued however and although the extensive goods depot which opened in 1970 never took the expected traffic away from Brighton it remained relatively busy for many years, finally closing on 26th June 1971. After closure the track was quickly lifted and the line was bought by Brighton Corporation. Kemp Town Station was demolished and the site is now occupied by the Freshfield Industrial; for a time the tunnel was used as a mushroom far and it is now used to store vehicles. Only the southern portal remains accessible within the fenced grounds of one of the industrial units. The northern portal has been demolished and the area landscaped at the back of a school playground. 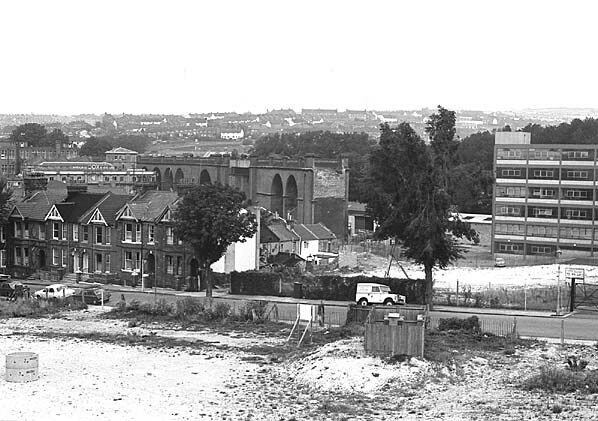 The short viaduct over Hartington Road was demolished in 1973 and the longer viaduct crossing Lewes Road and Melbourne Street was pulled down in 1976 with the last western section being cleared in 1983. Web Sites: My Brighton & Hove Includes history, photographs and reminiscences of the Kemp Town branch line. The site of Hartington Road Halt in September 1953. The halt was sited to the left of the locomotive.